During our trips to Mexico City, we’ve always purchased them fresh to eat for breakfast. With a little café con leche, I can’t imagine a better way to start a day. On one occasion, we carefully wrapped a few to bring home with us to Chicago, but sadly they got slightly smashed in our carry-on luggage and from then on, we decided they didn’t travel well. And after eating garibaldi on countless visits to Mexico City, I returned from our most recent trip with a serious mission: to spend time in the test kitchen trying to recreate them so I wouldn’t have to wait until my next trip to Mexico to eat them. Looking at my calendar, five months is a long time – too long, if you ask me – to deny myself one of my favorite sweet treats. There were two challenges I recognized immediately when I sat down to start developing this recipe. First, the pound cake had to be dense and flavorful but not too heavy. To solve this dilemma, I called in the big guns: my mom. She searched through her recipe drawer for a family recipe we were confident would work. (Thanks, Mom, and Grandma Audrey; I only made a few changes to the recipe.) And second, I knew the nonpareils were not going to be identical to the ones I could buy in Mexico, let alone the ones used at El Globo. Little did I know, finding nonpareils at all would be a challenge. I visited three grocery stores – including my usual go-to place in Pilsen, the Mexican neighborhood where I shop most often – and still no nonpareils in sight. In Spanish, they’re called grageas, chochos or chochitos. But no matter what I asked for, I still wasn’t having any luck finding what I wanted. Finally after a suggestion from a few friends, I tried a craft store that carried Wilton cake decorating supplies and lo and behold, they had them. I bought two 3-ounce bottles and crossed my fingers that they’d do. Once I finished making them, I sent samples home with three friends who grew up in Mexico and were familiar with garibaldi. José says they’re an amazing copy but that the chochitos were a little too crunchy (which we found lessened after 24 hours of softening when hydrated by the jam); of the other three, I only got one small suggestion but the overall verdict was that everybody loved them and wanted to know when I was making more. I’m so excited I can finally have garibaldi at home and I hope you’ll try making these, as they’re a favorite of ours and there’s nothing I love more than introducing someone to a new favorite. *This recipe requires a stand mixer. A silicone cupcake pan will also make this recipe easier, but is optional. Beat the softened butter & cream cheese on low speed until creamy and fluffy. Gradually add the sugar, beating 5-7 minutes or until sugar is incorporated and soft peaks form. Add eggs one at a time and blend just until the yolk disappears. Add vanilla and mix well to incorporate. Combine flour and salt and gradually add to butter mixture, continually beating at low speed until blended after each addition. Once blended, beat batter on a low or medium-low speed for a few minutes until it looks fluffy with soft peaks. Pour batter into greased silicone cupcake pan. (You can also use Pam to grease the pan if preferred – they make one that has flour in it and is specifically for baking). Do not fill each well more than half to three-quarters full or they’ll spill over during the baking process and you’ll have to trim them. Place the silicone cupcake pan on a baking sheet for stability. With an ovenproof 2-cup measuring cup (such as Pyrex glass), fill the measuring cup with 2 cups water and place in the oven with the cupcake pan. Bake at 300ºF at 45 minutes to one hour (the time will depend on your oven) or until a toothpick inserted in the center comes out clean. Once the pound cakes are mostly cooled but still warm, remove from the silicone mold and place upside down on a baking sheet lined with parchment paper. Heat the jam in a small saucepan or butter warmer (or at 20-second intervals in the microwave) until it is warm and more of a liquid consistency. Dilute with a tablespoon of warm water and mix well. Using a pastry brush or a spoon, coat the pound cakes with two applications of the jam and allow it to soak in to the cake for about five minutes for each application. It should soak about 1/8 of an inch into the cake. After the second application has soaked in, pour the nonpareils into a dish at least 2 inches deep or tupperware and roll each cake until they are completely covered in the nonpareils. 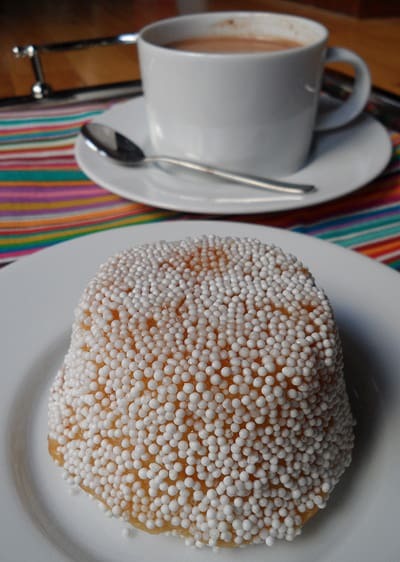 They should just be sticky enough to allow the nonpareils to stick to the cake, but you shouldn’t have any jam oozing. If they ooze, the cake needs to sit longer while the jam soaks in more. These will keep for about 4 days and should be stored on a cake plate with a dome top or in an airtight container. Note: the apricot (chabacano) are the traditional flavor; they also sell the raspberry (frambuesa) but they have not been around as long. Feel free to use whichever flavor jam you prefer. Yields 12 garibaldi. Goes great served with a little café, chocolate caliente, or an atole. Have you had garibaldi? What’s your favorite way to eat them? Let us know how they turn out if you make them at home! que delicia!, I´m so happy you decide to share this outstanding recipe with us!. Heidi, I hope you will make these! I know how much you love them. If you can’t find the chochitos, let me know. I have a friend in your part of the world in Singapore who might be able to help find them. Maura you have a talent to recreate the food that feeds our souls. Gracias! Pau, so glad you stopped by and saw this recipe! There are so many things we love from Mexico that we just can’t get in the States, but little by little I’m trying to recreate recipes both so that we can enjoy them in between trips and so that someday our kids can grow up eating the things we love so much. We have so many friends who have come to the U.S. from Mexico who really miss things from home and it fills my heart to be able to recreate some of these recipes that remind us all of our México lindo y querido! I want you to take me to Mexico! wow!! every time I go and visit my family in Mexico, I have to have one the first day I arrive!! and to my delightful surprise, they have created more flavors (I was there this past December)!!! as I was craving one in the worst way today, I frantically tried to see if I could somehow get them delivered or buy them in the USA, no luck! 🙁 and then I came across your receta and wow, it blew me away, thank you so much for doing the work and sharing it with us!! I can’t wait to go home and work on it this weekend, they are so worth it!! you have a new fan and twitter follower, thank you thank you thank you! Gracias, gracias, gracias!! You have no idea how much I’m craving a garibaldi right about now! I live in Mexico but the closest el globo bakery is about 1,000 miles away from me… so I will definitely try your recipe this weekend! Saludos! Where can I buy the chochitos? It depends where you live… but you can always order them online from baking supply makers. They’re often called nonpareils. why are these cupcakes called Garibaldi? Amazing!! is the original el Globo recipe? Que delicia!!! El Globo deberia tener una sucursal en cada ciudad del mundo… Gracias! Hola!! me ha encantado tu receta,la pondré en práctica y te aviso, GRACIAS por compartirla. Tengo solo una gran duda…. en qué ayuda las dos tazas de agia en el horno? Of the pastries my in-laws bring back from El Globo, these are my favorite! Do you know what the differences are in the healthy version that they make? I used your recipe to make these the other day and they turned out great. I think they get better the longer they sit around. I particularly like the little bite-size ones I made with a mini-cupcake pan. 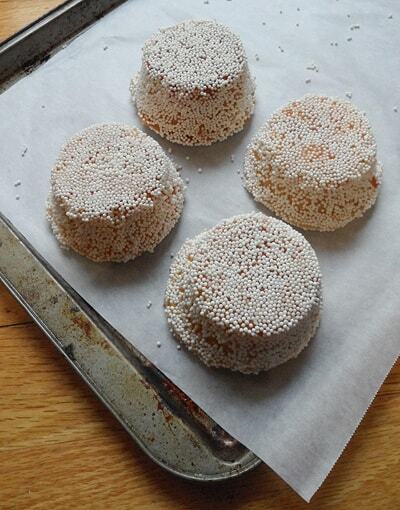 I ran out of nonpareils about halfway through, so I coated the rest of them in poppy seeds. They are terrific too! The taste reminded me a bit of my eastern European grandmother’s poppy seed strudels. The little black cakes are a nice contrast to the white ones. OMG! i DREAM about garibaldis from el globo! like you, my grandma travels with them often, bringing them to us from mexico city whenever she can.. usually they’re smushed, but they’re equally as delicious! i will try this recipe ASAP! THANK YOU! OMG!! I am sooo happy that I came across your blog!! I LOVE El Globo’s garibaldis… have been eating them for years. I don’t live in Mexico, but go there every few years, and now that my dad lives there he packs them up and brings some to me when he visits. I can’t wait to try this recipe!!! Hi there, I recently made the Garibaldis following your recipe and they came out great. Thank you very much for sharing your tips and recipes. Well my question is, how many garibaldis can you make with this recipe?? Hi Gaby, thanks for your question. Near the bottom of the post, it says that the recipe yields (or makes) 12 garibaldi (using a normal-sized cupcake pan). These are incredibly delicious! Our bakery in El Paso (El Prado Bakery) is currently trying to create these “pieces of heaven” but want to put them out once they are completely authentic. Love the site btw! I am so excited to try this recipe! I always ask my aunts to bring these lovely pancitos from Mexico when they visit. I’ve looked over a lot of recipes and they mostly use baking powder. Is this recipe correct without it? Just making sure they will turn out right. Thank you! Hi Cindy, yes it’s correct there is no baking powder in this recipe. It’s based off a cream cheese pound cake recipe that’s been in my family for ages. The cakes should come out dense due to the cream cheese and moist due to the water that you put in the oven to keep them from drying out. does anyone know how to make the chocolate version ? Annie, I don’t have a chocolate version but I will work on one this year! After I had my batter complete, I tried mixing in 1/2 cup cocoa powder and they came out very good. how do you make the chocolate version ?